The inaugural Australian School on Connectomics was held at the Melbourne Neuropsychiatry Centre on May 30 with support from the University of Melbourne, Centre for Integrative Brain Function, and Monash Institute for Cognitive and Clinical Neurosciences. 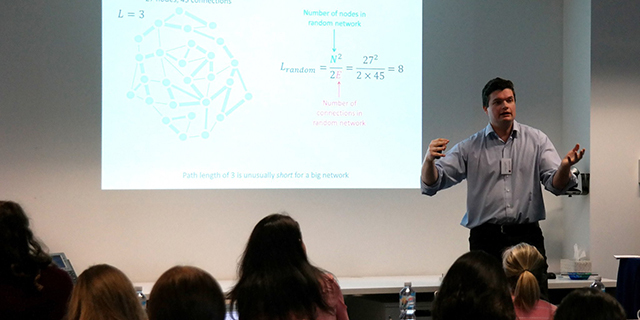 The three-day workshop, led by A/Prof Andrew Zalesky and Prof Alex Fornito, showcased internationally recognised experts, in the field of connectomics, from Australia and abroad. Attracting 40 national and international attendees, sessions covered the fundamentals of connectomics and provided participants with the necessary tools for initiating their own analyses. Connectomics is a burgeoning field helping many research areas, for example, psychologists interested in understanding the neural basis of cognition, neuroscientists seeking to understand brain network organisation in health and disease, or physicists seeking to understand how network science can be applied to the brain. Studying brain networks requires proficiency in new computational tools and an understanding of concepts from graph theory and network science. The three-day school provided an introduction to the fundamentals of these tools and concepts with the objective to equip participants with practical skills to build, visualize and analyse brain networks.